Collegiate. He later entered the work force, but it seemed that every job ended with a return to the home farm. In 1966, he rented two and one half quarters from Einar Sundmark - part of which was homesteaded by King Hemmingson - and began farming full time. In 1972, he married Myrna Thiele of Dauphin who was then teaching in the Erickson Collegiate. In 1973, Lorna and Myrna purchased the home farm. Farming activities included the building of a Charolais cow herd and a sizeable grain operation. In 1977, Lome became councillor for Ward 3 in the R.M. of Clanwilliam and for the most part has enjoyed this challenge. Lome and Myrna have three children - daughters, Lisa, born in November, 1976, and Leanne, born in May, 1980, and a son Kelly David, born in February 1983. Allen, Irene, Richard, Amanda, Hali. Allen William was born on January 14, 1948. He attended Scandinavia School and later Erickson Collegiate (travelled by horse and then by car). He helped his parents on the farm, along with his brother and sisters. In the fall of 1965, Allen moved to Winnipeg and attended Red River Community College. In 1967, Allen started working on road construction. Later he moved to Sudbury, Ontario, to work in the mines. On February 28, 1970, Allen married Irene Shuya of Toronto. In April, 1970, they moved back to Scandinavia and purchased N.E. 9-18-17W. farmers (clearing bush), road construction and farming. Irene worked for a time at the Erickson Co-op. A third child, Amanda, was born in December, 1979. Hali and Richard attended school in Erickson and violin lessons in Minnedosa. Mary, born in March, 1950, attended the University of Manitoba for two years. She married Murray Robinson in 1970, and had two children, Michael and Jackie. Murray and Mary were divorced. 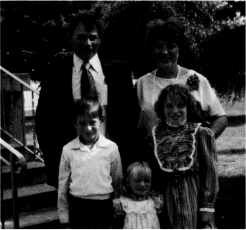 In 1981, Mary married Brian Welsh, they have one child and are presently living in Dauphin. Diane, born August, 1951. She married George Rogers. (refer to Rogers, George and Diane). Sherry, born February, 1961, attended Erickson Elementary and Collegiate. She was active in sports and enjoyed singing at the Lions' Talent Nights. Sherry married Dale Holmstrom in 1980, and they are employed in Brandon where they reside. Abe was born in Russia of Jewish faith. Threatened with compulsory Army duty under the Czar, he escaped from Russia just prior to the revolution, leaving his homeland and members of his family behind. He was about seventeen years of age when he escaped and later migrated to Canada. Abraham was a tall, quiet, religious man, a merchant by trade. He married Sarah Louise Browne, they didn't have a family. Sarah was a sister of Mrs. Tom McBratney. The Kopekens lived in various places among them, Arden, Eden and later in the Scandinavia area, pur­ chasing N.W. 7-18-17W raising some chickens, cattle and operating a store. Sarah, a music teacher, travelled on the train between Neepawa and Russell giving lessons in her younger years. When the Kopekens were too old to manage, they sold their farm to Frank Taylor and moved to Clanwilliam, Manitoba, to be near her only relative, a niece, Mrs. Rita McPherson. Hugh McPherson, bought the cattle and helped get them settled in their new home. Later the house was sold, they moved to a home in Bethany, Manitoba. Sarah's health was failing she was very crippled with arthritis. She passed away in the Minnedosa Hospital in 1954, at 93 years of age ­ Abraham, not being able to manage on his own stayed with the McPherson's until being admitted to the Salvation Army Home in Brandon where he passed away in 1955 at 93 years of age. Sarah was a staunch Anglican and they were both buried in the All Saints Cemetery north of Clanwilliam. A convention is a group of people who singly can do nothing and together decide nothing can be done.